Natural Anti-Allergen Laundry Additive. Add to your normal hot or cold wash to control indoor allergens including dustmites, pet dander and pollen found in clothes and bedding, which can cause skin flare ups, eczema, asthma, wheezing, sneezing and watery eyes. Contains the natural anti-allergens eucalyptus and ylang ylang to denature up to 99% of dustmites and neutralise pet and pollen allergens. Use with your normal laundry detergent and wash according to the fabric’s washing instructions. Leaves no smell once dry. 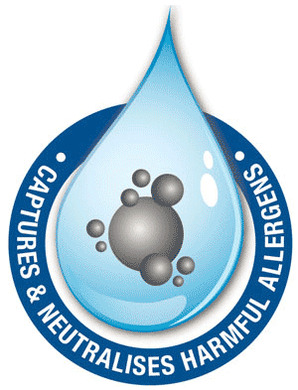 Encapsulates and neutralises allergens in laundry and carpets.